1. Luke 12:34 Where your treasure is there your heart will be also. 2. Matthew 4:4 It is written, man shall not live by bread alone, but by every word that proceeds out of the mouth of God. 3. John 15:7 If you abide in me and my words abide in you, you will ask what you desire, and it shall be done for you. 4. Ephesians 6:11-12 Put on the whole armor of God, that ye may be able to withstand against the wiles of the devil. For we wrestle not against flesh and blood but against principalities, against powers, against the rulers of the darkness of this world, against spiritual wickedness in high places. 5. Isaiah 55:11 So shall my word be that goes forth from my mouth; it shall not return to me void, but it shall accomplish what I please, and it shall prosper in the things for which I sent it. 6. Psalm 25:5 Lead me in thy truth, and teach me: for thou art the God of my Salvation; on thee do I wait all day. 7. Romans 5:1-6 Therefore being justified by faith, we have peace with God through our Lord Jesus Christ; By whom we also we have access by faith into this grace wherein we stand and rejoice in hope of the Glory of God. And not only so, be we glory in tribulations also; knowing that tribulations worketh patience; and patience experience; and experience, hope: and hope maketh not ashamed; because the love of God is shed abroad in our hearts by the Holy Ghost which is given unto us. For when we were yet without strength, in due time Christ died for the ungodly. 8. Lamentations 3:22-25 It is of the Lord's mercies that we are not consumed, because his compassions fail not. they are new every morning great is thy faithfulness. The lord is my portion, saith my soul; Therefore will I hope in him. The Lord is good unto them that wait for him, to the soul that seeketh him. 9. Ephesians 4:26 Be ye angry, and sin not: let not the sun go down upon your wrath. 10. Galatians 6:9 And let us not be weary in well doing; for in due season we shall reap, if we faint not. 11. Romans 8:18 For I reckon that the sufferings of the present time are not worthy to be compared with the glory which shall be revealed in us. 12. Psalm 121:1-3 I will lift up mine eyes unto the hills, from whence cometh my help. My help cometh from the Lord, which made Heaven and earth. He will not suffer thy foot to be moved: he that keepeth thee will not slumber. 13. Colossians 3:5 Mortify therefore your members which are upon the earth; fornication, uncleanness, inordinate affection, evil concupiscence, and covetousness, which is idolatry. 14. 1 John 4:18 There is no fear in love; but perfect love casteth out fear, because fear hath torment. But he that feareth is not made perfect in love. 15. Zechariah 4:6 Not by might, nor by power, but by my Spirit, says the Lord of hosts. 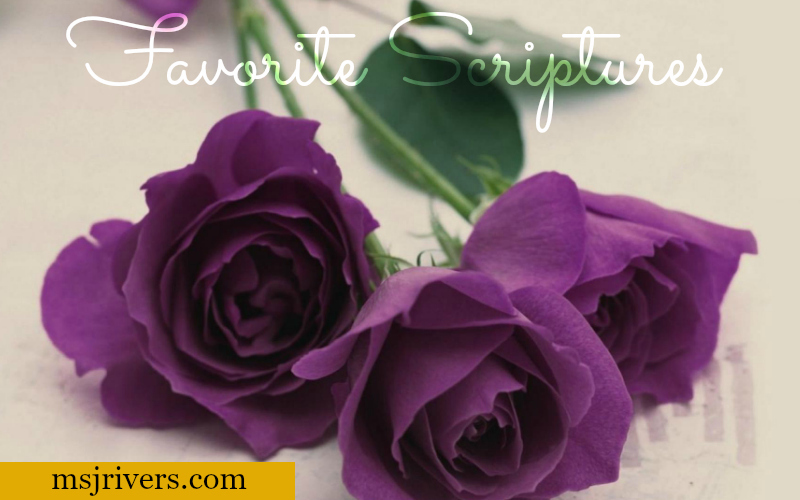 WHAT ARE SOME OF YOUR FAVORITE SCRIPTURES?? POST BELOW IN THE COMMENT SECTION.